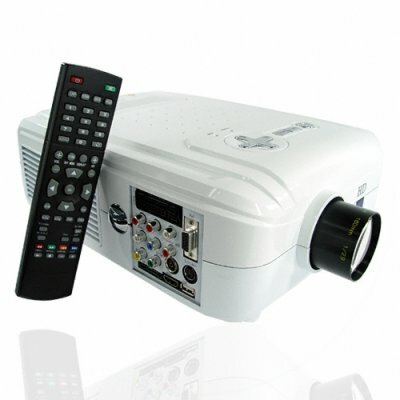 Successfully Added Superb LCD Home Theatre Media Projector with HDMI and DVB-T to your Shopping Cart. Superb LCD Home Theatre Media Projector with HDMI and DVB-T. When you need a big video display unit for your home or office then you need a projector with reliability and multiple video input types - the CVSAK-3300 is the product you have been looking for! With support for HDMI, Component and VGA inputs, massive size of up to 120 inches, and relatively short projection distance, the CVSAK-3300 will easily join your existing setup or be the basis for something new. Modern projectors are a lot better for movies than DLP (Digital Light Processing) based TV's in that they don't suffer the "rainbow effect" during fast moving images or when the person watching changes their viewing position. If you want to really enjoy your free time at home, then treat yourself right by getting a high quality display to enjoy. If you want to use this model for presentations in the office, then this unit will also handle your needs with flying colors. Having built-in speakers and easy keystone correction and manual focus adjustment, always get a good presentation image whether you set this unit up in one place all the time or move it around from office to office. Add to all this, the ability to view from multiple video input types (including USB and SD cards) plus built-in Analog and DVB-T TV tuners and you have the makings of a new best friend - the CVSAK-3300 Media Projector! Available right now at a factory direct wholesale price. Click "Add to Cart" now to preview the shipping cost and have us instantly ship this out to you today. Do not pass up the opportunity to see just how good this projector really is! This projector is fitted with a 220-240V power supply and is incompatible for use in North America and other countries using 100-120V power supplies. I live in the United States, will this projector work for me? This projector uses a 220-240V power supply whereas power outlets in the US deliver 100-120V. It will not work. If you are interested in a 100-120V version of this projector and will be ordering at least 5 units though, please contact our customer service team. This projector uses the model CVSAK-3301-2GEN bulb. This home theatre, is a great reseller, one tenth of the asking price in major stores,for private use the quality it feels like your sitting in a 3D lounge,compact unit, with a quality output, i give it a 10/10. on 2010-10-27 17:44:27 Love it! ive searched quite a while for a good projector. had a HP before, but the replacement bulbs are just as expensive as the system. then i decided to give this one a try. it has about every IN-plug youll ever need and the picture quality is really high. i use it on my 3m dia projection canvas, and its crystal clear. and since everybody seems to complain about the noisy fan, i dont even hear it after a few minutes. and the replacement bulbs are long-lasting and very affordable! Would I recomend it? I really think you should buy it!